Our Goals -To make the inner beauty of women reflect in their eyes and skin! Master Stylist, Karen Thornton, brings professional expertise to all aspects of Beauty. Her exceptional experience and artistry combine to create the look on your Wedding Day you always wanted! Charleston Makeup Artist Karen Thornton provides exceptional on-site Bridal wedding hair, makeup, & airbrush makeup. Our Wedding Salon comes to you! 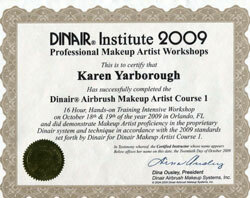 Karen Thornton is a Licensed Cosmetologist & a Dinair Certified Airbrush Makeup Artist! I began my career in the Beauty Business 20 years ago. My entre to the business was selling cosmetics at Belks of Savannah. My passion for making women look and Feel Beautiful brought me tremendous success! After a very short time I became Number 1 in the Nation! for cosmetic sales. My experience also includes skin & makeup clinics. I have continued my training to stay on top of the latest Fashion Trends & Techniques to provide my Brides & Clients the Best Beauty Treatments in the Industry! I furthered my career by training to be a licensed cosmetologist. I went to work for Salons in Savannah, Myrtle Beach, Charleston and the Sanctuary Resort on Kiawah Island. In addition, my experience includes Hair & Makeup for Television, Films, Modeling Agencies, Portrait & Wedding Photography, Fashion Shows, Shoots, Magazines, Proms & Beauty Pageants. My years of experience in Hair and Makeup allows me to be exceptionally qualified to work with Brides and their entourage and perform the entire beauty process on the day of their Wedding!